Jacalyn Ryan, employee benefits specialist for the Oswego County Personnel Department, announced she will retire after 26 years of dedicated service to Oswego County government. 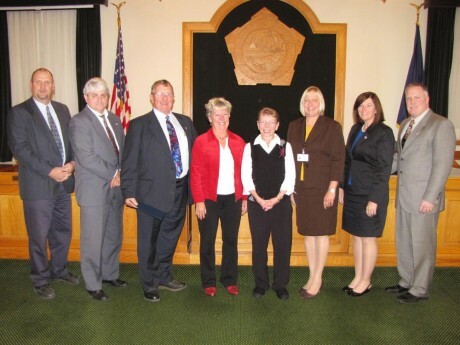 She was presented a certificate of appreciation and received a standing ovation from the Oswego County Legislature. Pictured from left are members of the Finance and Personnel Committee, Kevin Gardner, District 13; Committee Vice Chairman Dan Chalifoux, District 19; Committee Chairman Arthur Ospelt, District 12; former County Personnel Director Maureen Sullivan; Ryan; County Personnel Director Carol Alnutt; Amy Tresidder, District 16; and Michael Kunzwiler, District 18.